Hear, O thou Shepherd of Israel, thou that leadest Joseph like a sheep. Tell us, art thou he that should come? Stir up thy strength, O Lord, and come to reign over thy people Israel. 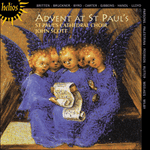 The so-called Mattins Responsory by Giovanni Pierluigi da Palestrina (1525/26–1594) is, in fact, an adaptation of a Magnificat, together with words which are a translation of the First Responsory of Advent Sunday in the Office of Mattins in the early medieval Roman rite. This adaptation has become widely known through its usage at the Advent Carol Service at King’s College Chapel in Cambridge. At St Paul’s Cathedral the Responsory is sung at the west end of the building before the procession moves. It is complemented at the end of the service by the Vesper Responsory which is found towards the end of this sequence.